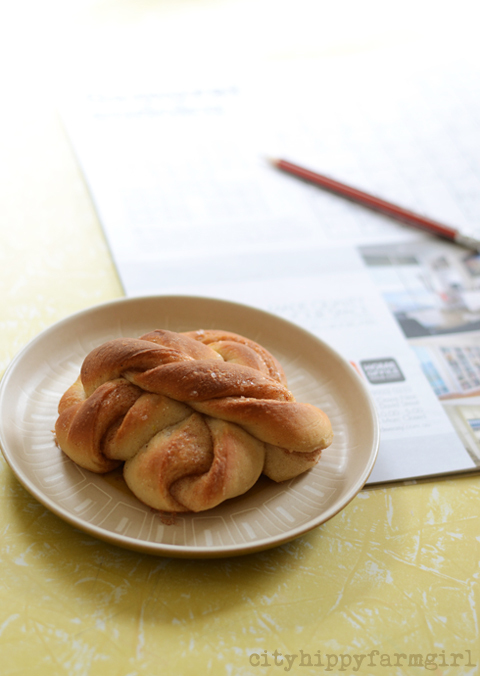 This entry was posted in Baking Bread and tagged cardamon buns, cinnamon bun day, cinnamon buns, kanelbulle, morten schakenda, skillingsboller, sourdough by cityhippyfarmgirl. Bookmark the permalink. 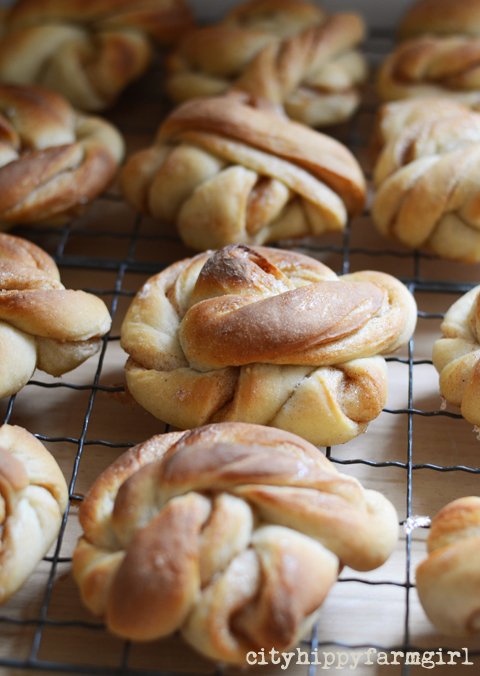 Now I have to make cinnamon twisty buns! I’m hooked Heidi, I’m not sure I’d be able to make an untwisty one now! These look delicious. 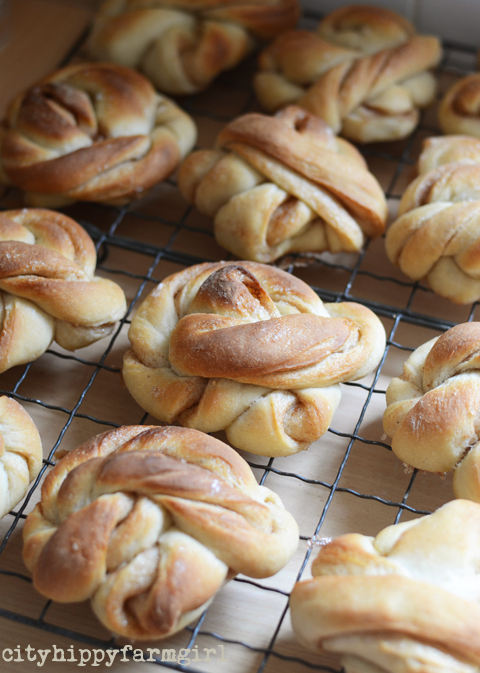 I’ve tried cinnamon buns cooked by Icelandic friends and loved them but when I tried to replicate them from internet recipes I was disappointed – now I see that it was the sourdough starter that was missing. Inspired to have another go. Oh dear, there’s every chance I’ll end up tying myself in these! Guess what else is cool about Norway? Last Friday night they had a national knitting night — imagine a whole country sitting down to knit together! Rose that is beyond cool. A national knitting night?! Can’t wait for the weekend! Saturday will be my Cinnamon Bun Day! Wish I could come through the screen and try one now too! Did you use a step by step set of instructions or photos…as you in turn have inspired me to try and do too! Thank you! Hi Joanne, thanks for popping in. If you click on the link with Morten Schakenda, he shows you how to roll them. Far easier than I thought they would be! I think they’d look pretty spectacular all lined up in your outdoor kitchen area Jane. Oh Brydie they do look amazing…I hate to ask it, I know of course they’ll be amazing with sourdough starter, but I just can’t wrap my head around getting one happening yet. Any suggestions of how much extra yeast would be needed if I was to attempt them without sourgdough? Brydie, they look stunning! What a brilliant job you’ve done with them! aww, beautiful! i have 4 very wonderful swedish women for besties and they just make the best cinnamon buns… they’re of the same sentiment, any day can be made better with cinnamon buns. now i’m enthused to attempt them myself. Oh you lucky, lucky thing. I would love to live there for awhile too. Love this clip.. Always inspiring. I’ve been meaning to make cinnamon buns for ages. I really should get on to it… Next weekend. ooh I am so behind on your blog! I have been to Lom! A long long time ago, but probably before this baker was there, he looks great and your buns look fabulous as always! Wonderful, I must bake some really soon!! Ooooh you’ve been to Lom! Joanna you must go back…must! I’d love to sit in his bakery looking out over the water gushing past.